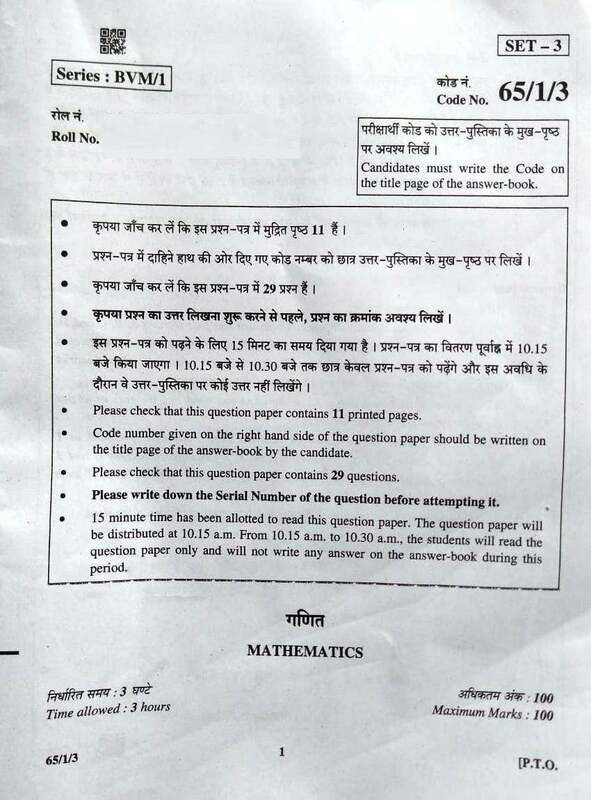 Download CBSE Class 12th Maths Paper 2019 in PDF format. Link to download the complete CBSE 12th Maths question paper 2019 is given at the end of this article. CBSE 12th Maths Board Exam 2019 was held on 18 March from 10.30 A.M. to 1.30 P.M. Students appeared for this exam shared their feedback with Jagran Josh. Learn what students are saying about the difficulty level of the CBSE Maths paper 2019. (ii) This question paper contains 29 questions divided into four sections A B, C and D. Section A comprises of 4 questions of one mark each, Section B comprises of 8 questions of two marks each. Section C comprises of 11 questions of four marks each and Section D comprises of 6 questions of sir marks each. (iii) All questions in Section A are to be answered in one word, one sentence or as per the exact requirement of the question. (iv) There is no overall choice. However, internal choice has been provided in question of Section A. 3 questions of Section B, 3 questions of Section C and 3 questions of Section D. You have to attempt only one of the alternatives in all such questions. (v) Use of calculators is not permitted. You may ask logarithmic tables, if required. All the questions are available in the PDF.